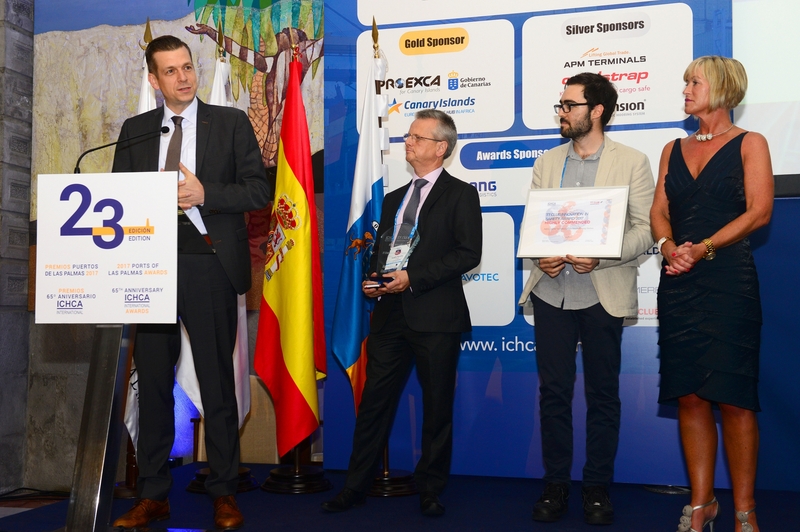 05.10.2017 – The TT Club Innovation in Safety Award is now in its second year and the winner was announced at ICHCA’s 65th Anniversary Conference in Las Palmas this week. The Award is aimed at identifying innovative developments that engender greater safety and efficiency in the intermodal supply chain. Following the inauguration of the award last year, TT Club and ICHCA have been delighted with the response of the industry, which resulted this year in some twenty-two high quality entries, each revealing exciting and proven improvements to supply chain practices. Indeed the value of Cargo Patrol has grown year on year and now identifies in the order of 1,250 potential undeclared or misdeclared bookings each day. During 2016, the total of 264,000 alerts resulted in 4,200 positive ‘hits’ – many of these bookings were subsequently cancelled by the line. As this often results in the ‘problem’ cargo moving on to another line, Hapag-Lloyd has taken the decision to pass its software to IBM for further development and in order to make the solution accessible to all shipping lines. The judging process was rigorous and intense, as the range of entries displayed both a great diversity of safety issues, as well as tremendous passion, effort and ingenuity. The task of evaluating the entries was, for the five judges (listed below) therefore a formidable one; so much so, in fact that they chose to also award a Highly Commended honour. This went to Safety Ammo. The dangers faced by ‘pinning’ workers – those who physically handle twistlocks on the underside of containers on the waterfront – are considerable. Safety Ammo is a RFID-based safety solution that brings together practical operational expertise within a range of technologies and requires minimal user interaction. It monitors in real time any personnel within the safe zone and indicates all activity through a simple interface. The result is that the ‘pinning station’ can notify any external control systems of workers’ whereabouts, thereby significantly increasing the safety of those exposed. Open to individuals, teams or companies involved in cargo logistics, entrants for the ICHCA International Innovation in Safety Award had to provide evidence to show that a product, idea, solution, process or scheme had resulted in a demonstrable improvement to safety.